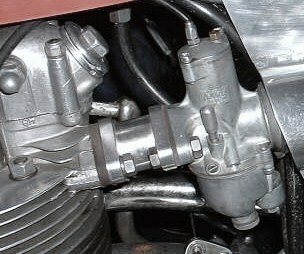 Ask me for BSA C15/B40 parts I may know where to get them or can find out. You "Ask Me" for parts for your bike, and we will see if we can Help. 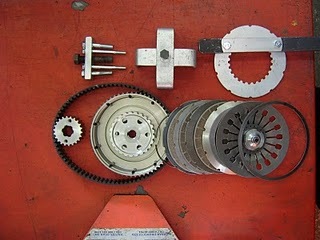 This is the Pete Kirby Belt Drive Clutch Kit. Pete's phone Number is 07886 745942. Pete is out of action for a couple of weeks to have a new hip fitted, but I will let you know how he is doing, and when normal service will be resumed. Just look at the parts you get in this kit. and I have worked out that it is cheaper to fit one of these now, than it is to fit a standard New Clutch, with 18 tooth engine sprocket and chain, along with he slipper chain adjuster. OK thats Sorted the Clutch then. I have been asked several times, where do I get this or that from, for my "Otter" BSA. So I thought it was a good idea to set up this page. You can "ASK ME" where is the best place to get parts from, for your engine or frame, ETC, If I dont know,I will have a jolly good try to find out for you. You can also "ASK ME" about technical aspects about your bike, again if I don't know, then I will have a good try to find out the answer. 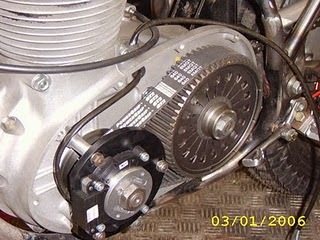 Johannes Salch, from Germany, Has asked me, where do I get a diaphragm clutch to fit my BSA B40 and also a wide top gear. Well Joannes, here is a clutch along with the belt drive as well, (at the top of the page). This comes from Peter Kirby. Tel 07886745942.UK. I have spoke to Pete today and he tells me another batch of these clutch/beltdrive kits will be available in about 3-4 weeks Price,£395.approx. He also told me that he has been testing these clutch kits on his own BSA for the past 3-4 years, and he has ridden in the Pre65 Scottish,and Manx Classic two day trial, along with Welsh three day trial every year since fitting it. So you could say that the kit has been well and truly tested. The contact number for the high top gear is, 0182757207 The company name is " SET". I will give them a call to get a price for you. 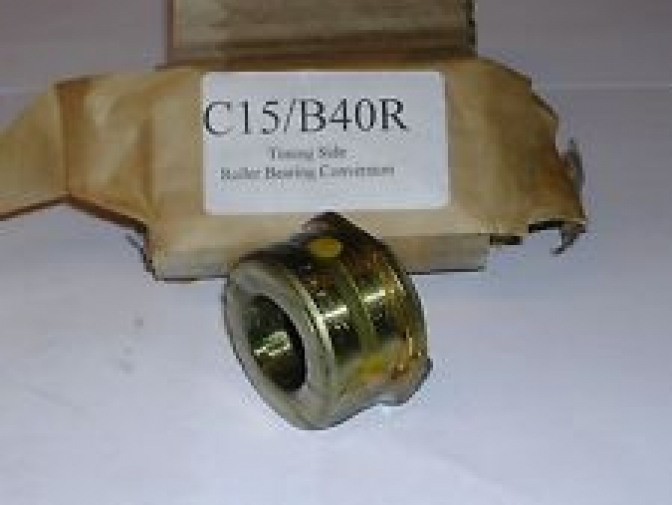 I have been asked where to get carb spacer's from, for C15-B40 engines to Amal Concentric, 25mm wide. To be honest I don't know, and looking can't find any. So It looks like I may produce some myself. Interested? As you and a few more inquires, are interested in the spacer's, above,my machinist and I will see what we can come up with to this pattern below. And for you, that just want a simple oval spacer 25mm long, with longer studs, and bored to your preferred size, let me know and we will see what we can do. We will bore them from 25mm to 32mm. I will try and keep the cost as low as I can. OK , The first four spacers are made,the CNC program is now on file. 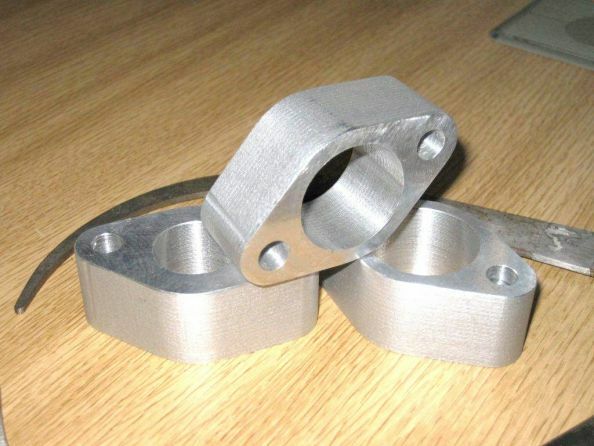 We have made two 32mm spacers that I think are sold, and two 24mm, as we think this is the starting point for sizes, 32 mm is the maximum. I will put pictures of them onto this site shortly.and the final price. thinking £17. these will be for sale on my e-Bay site as soon as we make the next batch,(details later). There you are then boy's ! sizes. 24,26,28,30,32,mm. Bores made slightly under,so you can polish them if you wish. BSA C15/B40 timing-side needle roller bearing conversion. I have been asked for information about the Alpha timing-side conversion. So I mailed Max Nightingale at Alpha Bearings. He tells me that they are making a new batch of these bearing conversions this week 26/03/2014, and they may be ready by the end of the week. The current price is £141.oo plus Vat, and Carriage. So if you are contemplating doing this most necessary conversion in my mind, has you get better oil flow to that precious big-end bearing. And like Dave Wood said fit and forget. He had one fitted into his old bike and it was still good when he sold the bike. OK there will be a lot more contacts on this page shortly. 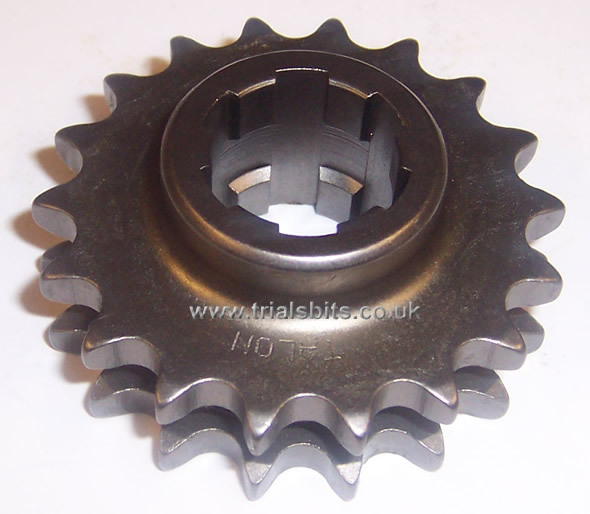 I have had an inquiry from Bob saying where can I get a BSA C15 18 tooth engine sprocket. as know one seems to have them in stock any more. So I emailed Amanda at "Trialsbits" and she says she will contact Talon on Monday , as they were out of stock at the beginning of the month, and need two to three weeks in production. So there will be more and I will let you know when Amanda mails me. Amanda at "Trialsbits" now has the 18 tooth Talon BSA engine sprockets. NOW Back in Stock. But hurry as they are very popular, she has just sold three in five minuets. Another one . 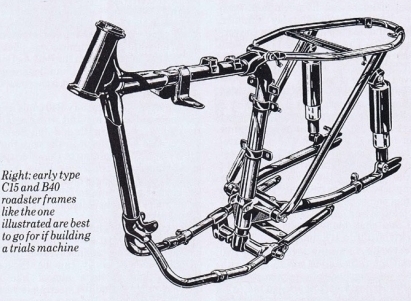 Geoff Garland as Asked if anyone has a BSA C15 frame "left hand side side-stand and pillion foot-rest tube mounting" from the bottom casting, they have cut of to convert the frame to a trials bike. he needs that part to restore the road bike he his working on. So if you have one you have cut of, mail me and I will let Geoff know. As anyone got Peter Gaunts Phone Number Please. I have the New owner of his Ex works 350 Royal Enfield Crusader, needing to contact him. Dont be afraid to Ask Me. Hi. I hope you can shed some light on a problem I am having with a BSA B40 trials bike. Unaware that there was a problem my friend drove this bike for 150 miles then noticed something wrong in the clutch area so took the cover off and noticed some teeth missing on the clutch basket sprocket. Bought another one and tried again .Didn't really look for why it happened. Same thing happened again. Then the bike came to me. Not wishing to brag but it was obvious that the clutch was running way out of line and the chain was rearward half a chain width if you eye it along the inner chaincase. Either the clutch hub on the main shaft was wrong or the engine sprocket was wrong or the gearbox was assembled wrong somehow. But how did the gears all work correctly? I have a workshop manual but before I investigate the gear box or buy a new hub only to find it's the same as the one that came off, I thought I would take you up on your kind offer of advice. Charlie~Oo> First I need more information about the engine in the bike. Send me the engine number and then I can find out the year etc. and whether it has a four or five plate clutch. Is it a road bike? or trials bike?. because that will give us a clue to whether it has a 18 tooth engine sprocket or one a few teeth larger. So if you can do that for me we can try and see if we can solve the problem.